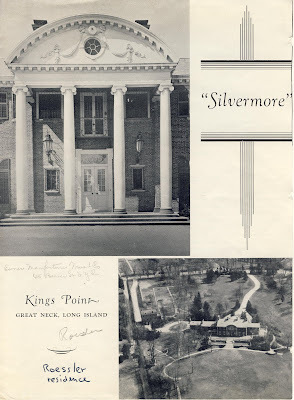 A brochure advertising 'Silvermore', the Edward Roesler estate in Kings Point. 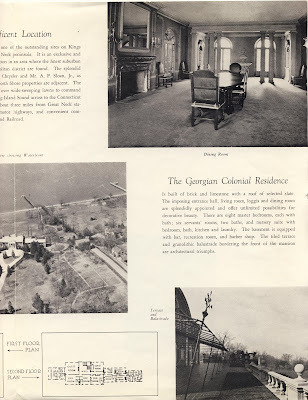 There is not a whole lot on this place, Roesler's name was apparently misspelled on maps as A. Roesler, and according to the Spinzia book the house was called 'Augustina'. Roesler was a partner at Laidlaw and Co. (his wife was Jessie Onderdonk Laidlaw), an investment banking firm. The house has since been demolished. Name of estate as Augustina confirmed by 1934 NYTimes wedding announcement of the Roeslers' daughter Rutherford Roesler to Elliott Conger Baker. The Roeslers had another daughter, Jessie Laidlaw Roesler. 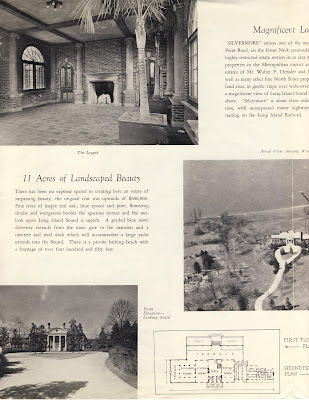 And the estate's name apparently was in honor of Edward Roesler's father, August Roesler. 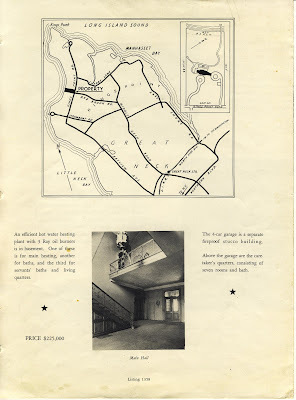 This was the estate of wall street operator, Jesse L. Livermore. He purchased the home in 1922 from August Janssen. It was auctioned for past due taxes in 1933. I just love a Dining room you can land a plane in... Interesting to note the amount spent on construction then the amount it sold for... Guess these big old estates were like Cars not really holding much value... Stunning and I cannot thank you enough for what you do for us each and everyday!!!! The bargain sell price had more to do with the fact that the owner went bankrupt, shot himself, and then left unqualified parties to deal with the creditors. Considering that, it's a rather remarkable feat that Silvermore sold for cost. Also, the large price tag is irrelevant. How well did the average middle class foreclosed home do at the auction block during 2008 and 2009?